Expectations are strong that the next five years will see dramatic growth in green and energy efficient building renovation. A new survey from the Property Management Software Guide investigates how those expectations are currently unfolding, focusing on multi-family dwellings, a segment comprising 20 percent of all household in the U.S. 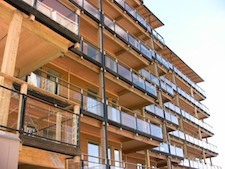 The short, 7-question survey for apartment building owners and property managers will help determine roadblocks preventing some owners from implementing energy efficient retrofits, and the type, cost, and satisfaction for those owners and managers that have carried out green renovations, as well as their plans for future upgrades. Whether you’re an apartment building owner or not, the results will provide insight on how well sustainability in the built environment is taking hold in an important sector of the real estate market and building stock in the United States. Check back with Software Advice as the survey plays out and the results analyzed.